We have reference to the eastern cross by two noted historians. Petrie, when he visited Kilfenora in 1821, said that the one that stood at the entrance to the town from the eastern side fell in 1818 and was totally destroyed. Frost in his “History of Clare” said that the broken pieces of a cross were to be found in the yard of a house adjoining the village. There is very little local lore connected with the eastern cross. One item I got from Michael Slattery [of Kilfenora] is that he heard his father relate that the broken parts of a cross were to be found in the yard of Canny’s house in the village. 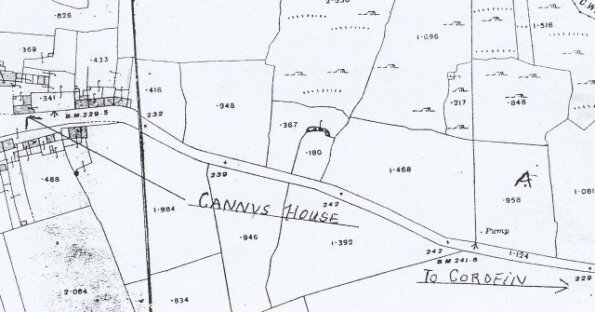 This Canny house was a two storey corner house that stood where the Lisdoonvarna and Corofin roads meet, and this family were the owners of some land a short distance out the Corofin road on one’s left. The house was demolished in the 1950s, and the stones removed for road works. From what I can learn the field owned by the Cannys is the one I have marked “A” on the map, so we are surmising that the eastern cross stood somewhere in or near this field.